Egyptian Foreign Minister Sameh Shoukry on Thursday urged Arab League member states to create a joint Arab military force to face regional security challenges. Arab foreign ministers held a plenary session in the southern Sinai resort of Sharm El-Sheikh to prepare for the upcoming Arab League summit, focusing their discussions on the Yemeni crisis. 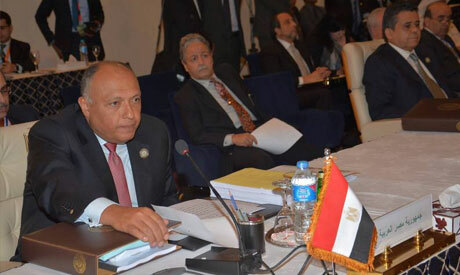 Shoukry, who chaired today’s meeting on behalf of Egypt as the host, expressed his hope the Arab League would take positive steps to implement Egypt’s previous proposal to form a joint Arab force. The foreign minister told delegates Egypt's proposal aims to strengthen the Arabs’ ability to take their fate into their own hands. Egypt's President Abdel-Fattah El-Sisi has called on several occasions for a joint Arab military force to "fight terrorism" after the Islamic State militant group beheaded 20 Egyptian Copts in Libya in January. Shoukry said “national security” in the Arab World still faces significant “challenges” as “sectarian conflicts” expand and double the challenge “terrorism” poses. He also reiterated Egypt’s political and military support for the Arab military operation under-way against Houthi rebels in Yemen. The Arab Summit will be held on 28-29 March in Sharm El-Sheikh. Four Arab Gulf states, including Bahrain, Kuwait, Qatar and the United Arab Emirates, as well as Jordan, Morocco, Sudan have all joined the Saudi-led coalition against the Houthis.